Why focus on digital food marketing? Legal and child development scholars have identified promising theories for why all marketing, including digital food marketing, targeting children under 8 years of age, is inherently deceptive.1 Prior to age 8, research demonstrates that children cannot understand the persuasive intent of advertising. Food marketing campaigns targeting youth integrate food packaging, websites, mobile applications (apps), and viral marketing techniques to get children and teens to request and consume unhealthy food and beverage products. Our research into the digital marketing tactics currently being deployed with children and teens found a number of clearly articulable and specific state consumer protection law issues that warrant regulatory oversight. State governments are at a critical juncture with respect to ensuring the future health of their residents. Diet-related disease threatens the current and future well-being of children and teens. The Centers for Disease Control projects that by 2050, 1 in 3 U.S. adults could have diabetes.2 The number of diabetics living with limb loss is projected to triple by 2050, and African American and Hispanic diabetics are almost 3 times as likely as non-Hispanic white diabetics to lose a limb.3 Medical costs associated with diet-related disease are projected to rise between $22 and $48 billion per year by 2030 with a substantial portion paid for by Medicare and Medicaid.4 This chronic disease burden begins in childhood when eating preferences and food culture are ingrained. Food marketing plays a major role in the foods children and teens desire, perceive as tasting good, request their parents to buy for them and ultimately purchase for themselves. State oversight of digital food marketing is integral to protecting vulnerable child and teen consumers. 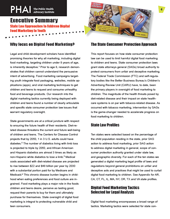 This report focuses on how state consumer protection law can be used to limit harmful digital food marketing to children and teens. State consumer protection laws grant state attorneys general (SAGs) broad authority to protect consumers from unfair and deceptive marketing. The Federal Trade Commission (FTC) and self-regulatory bodies like the Better Business Bureau's Children's Advertising Review Unit (CARU) have, to date, been the primary players in oversight of food marketing to children. The magnitude of the health threats posed by diet-related disease and their impact on state healthcare systems is on par with tobacco-related disease. As occurred with tobacco marketing, intervention by SAGs is the game-changer needed to accelerate progress on food marketing to children. Ten states were selected based on the percentage of the child population residing in the state, prior SAG action to address food marketing, prior SAG action to address digital marketing in general, scope of consumer protection authority granted under state law, and geographic diversity. For each of the ten states we generated a digital marketing legal profile of laws and regulations beyond general prohibitions on unfair and deceptive acts and practices that might be used to curtail digital food marketing to children. See Appendix for AR, CA, CT, FL, IL, MA, NY, OR, TX and VA state profiles. Exploits age-specific vulnerabilities of child and teen consumers. This report also covers personal jurisdiction issues related to digital food marketing and federal preemption of state regulation of mobile food marketing. Digital marketing is harder for youth to identify as marketing: Digital food marketing works in conjunction with traditional media such as television, print media, and food packaging by integrating websites, mobile applications (apps), viral marketing techniques and location-based tactics to get child consumers to request and consume unhealthy food and beverage products. Research into children's ability to identify digital marketing as a form of advertising indicates that digital marketing is harder for them to identify than traditional television commercials. A 2013 study explored the ability of children versus adults to recognize advertisements embedded in mock webpages.5 Adults identified all of the advertisements, but 6-year-olds identified just one quarter, 8-year-olds about half, and 10-year-olds identified about three-quarters of the advertisements shown. The study authors noted that similar studies of children's ability to identify television commercials have found that children can identify commercials as distinct from programming by the age of six and understand persuasive intent around 8 years of age. Thus, digital advertisements are harder for children to identify as marketing than television commercials. Marketing is no longer a one-way communication: Traditional marketing tactics delivered a commercial message on television, radio or in print, and that was the extent of the communication. The new food and beverage marketing is interactive, delivered online and via handheld devices, and is driven by huge caches of data that consumers generate when they make online or mobile purchases. Marketers have unprecedented access to consumer data that can be used to target and tailor marketing messages to maximize sales. Path-to-purchase: The "path-to-purchase" model of marketing integrates physical location, purchase and consumption history, and prior engagement with unhealthy food and beverage marketing to guide consumers as they make food purchasing decisions. This tactic may seriously undermine public health efforts to reduce the consumption of unhealthy foods and beverages. As the core demographic for junk food marketing and heavy mobile device users, teens are prime targets for path-to-purchase marketing. The power of social marketing: Social media marketing is designed to get consumers to share commercial messages. It is most successful when young consumers share commercial content without realizing that they have become marketing proxies for large corporations. Unfair and deceptive food packaging: Food and beverage packaging is a prime jumping-off point for children into the digital marketing world. Food packaging often directs children to company websites for activities, videos, and contests. Product packaging is a major loophole in CFBAI's self-regulatory framework governing the nutritional quality of foods marketed to children under 13.7 The integration of digital marketing components into food packaging is designed to prolong children's exposure to unhealthy food marketing and exploits children's natural curiosity. These packaging features are totally unrelated to any actual food product characteristics. As such, they are not governed by the federal Nutrition Labeling and Education Act and are subject to state consumer protection law provisions. Disguising advertising as entertainment so that the target audience is unable to identify it as commercial in nature has been found to be deceptive with adults.8 Child-directed codes, invitations to visit a website, directions for how to download a mobile app to play a game or to experience an augmented reality feature designed to interact with packaging are similarly deceptive because they are intended to lead children to engage with content that they likely cannot even identify as advertising. Privacy: Privacy protections are important to protect children and teens from aggressive digital junk food marketing. States have successfully enforced the Children's Online Privacy Protection Act (COPPA) to protect children under 13 years old. Teens, however, are a key target demographic for digital food marketing and are not protected by COPPA. Other state privacy and general consumer protection laws can be invoked to protect them. SAGs can play a vital role to fill the gap around teen privacy, especially with regard to targeted and localized digital marketing. The detrimental impact of advergames on child health is supported by sound research linking them to increased overall calorie intake as the result of increased snacking after playing advergames featuring food.11 Food companies use direct inducements on retail food packaging and on food company websites in order to enhance the advergaming experience. Inducements to purchase that are linked to advergames make the tactic highly material to the purchase of unhealthy food products. Such direct inducements to purchase products linked to advergames are difficult for children to filter or avoid because they simply do not recognize the inducement as marketing. Instead, children view such inducements only as an opportunity to play a game. Children cannot avoid the health harm caused by playing advergames — the powerful cueing effect on eating behavior — because it is deeply subconscious. Advergames offend the established consumer protection law principle against deceptive marketing in the form of entertainment or news that a reasonable member of the target audience likely will not recognize as marketing. Advergames violate this principle because children likely perceive advergames simply as entertainment and not as a form of marketing. All of these factors render the use of advergames with young children an unfair trade practice. Similarly, advergames are a deceptive trade practice, because children likely cannot recognize advergames as marketing. This means that children are likely to be misled into requesting or purchasing products in order to play games. Digital sweepstakes and contests: Incentives-based, interactive marketing uses digital technology to deploy sweepstakes to younger and younger audiences. Complex digital sweepstakes schemes are being deployed by major food companies like Kraft Foods with children 6 to 12 years old. SAGs have primary responsibility for policing promotions and children, who cannot protect themselves, are in need of protection from predatory sweepstakes. In the past five years, CARU has issued 12 complaints against its member companies for sweepstakes and instant win games that exploit children's inability to comprehend that a free means of entry exists or the actual odds of winning prizes.12 Food companies were responsible for half of these cases. CARU's work has uncovered a pattern of abuse in the use of sweepstakes with children under 12 years-old warranting more robust legal interventions by SAGs. Young children, however, lack the sophistication to understand the concept of "no purchase necessary" or that an AMOE exists. A 2004 report by the American Psychological Association on advertising to children found that young children do not comprehend the intended meaning of even the simplest commonly used disclaimers. The report noted that "fewer than one in four kindergarten through second grade children could grasp the meaning of 'some assembly required' in a commercial," and even the use of child-friendly language like "you have to put it together" only resulted in half of children being able to understand the disclaimer.14 Young children simply cannot be expected to understand disclaimers conveying that an AMOE exists. When the target audience is not adequately informed that an AMOE exists, sweepstakes are rendered illegal lotteries for failure to remove the element of consideration. Sweepstakes are the province of state regulators, and industry self-regulation has uncovered widespread use of sweepstakes in ways that exploit children's inability to comprehend that a free means of entry exists and to understand the actual odds of winning prizes. The use of games of skill where young children play simple videogames is also highly suspect as such games may not be adequately skill-based. SAGs have primary responsibility for policing promotions and children, who cannot protect themselves, are in need of protection from these predatory marketing practices. This report also explores how food companies use video games produced by the entertainment software developers as a marketing platform. It contains a guide to social media food marketing using Facebook and Facebook marketing tactics that raise consumer protection concerns for teen consumers. 1 Samantha Graff et al., Government Can Regulate Food Advertising To Children Because Cognitive Research Shows That It Is Inherently Misleading, 31 Health Affairs 392 (2012). 2 Press Release, Centers for Disease Control and Prevention, Number of Americans with Diabetes Projected to Double or Triple by 2050 (Oct. 22, 2010), http://www.cdc.gov/media/pressrel/2010/r101022.html. 3 Kathryn Ziegler-Graham et al., Estimating the Prevalence of Limb Loss in the United American Diabetes Association, Living with Diabetes: African Americans & Complications, http://www.diabetes.org/living-with-diabetes/complications/african-americans-and-complications.html (last visited June 27, 2012); Nat’l Limb Loss Info Ctr., Minorities, Diabetes and Limb Loss (May 2008), http://www.amputee-coalition.org/fact_sheets/multicultural/all_groups.pdf (citing Robert Preidt, Blacks, Hispanics Hospitalized More Often for Diabetes, Heart Disease, HealthDay: News for Healthier Living, Aug. 15, 2006). 4 Y. Claire Yang et al., Health and Economic Burden of the Projected Obesity Trends in the USA and UK, 378 The Lancet 815, 818 (2011); Jeffrey Levi et al., F as in Fat: How Obesity Threatens America's Future 2012, 1, 32 (2012), http://healthyamericans.org/assets/files/TFAH2012FasInFatFnlRv.pdf. 5 Mark Blades et al., Children's Recognition of Advertisements on Television and Web Pages, 62 Appetite 190 (2013). 6 For a summary of case law related to stealth marketing, see Center for Digital Democracy, et al., Complaint and Request for Investigation of PepsiCo's and Frito-Lay's Deceptive Practices In Marketing Doritos to Adolescents [hereinafter CDD Complaint], (Oct. 19, 2011), http://digitalads.org/sites/default/files/publications/digitalads_ftc_complaint_2011.pdf (last visited September 12, 2013). 7 Children's Food and Beverage Advertising Initiative, Council of Better Business Bureaus, Inc., Children's Food and Beverage Advertising Initiative and Core Principles Statement (Sept. 2010), http://www.bbb.org/us/storage/0/Shared%20Documents/Enhanced%20Core%20Principles%20Third%20Edition%20-%20Letterhead.pdf (last visited Nov. 18, 2013). 8 CDD Complaint, supra note 6. 10 See, e.g., Press Release, Children’s Advertising Review Unit (CARU), CARU Recommends Spangler Revise ‘Dum Dum’ Website to Clearly Disclose That Games, Activities are Advertising; Company Agrees to Do So (Dec. 17, 2010), http:// www.caru.org/news/2010/CARUDumDumPR.pdf (last visited Nov. 18, 2013). 11 Jennifer L. Harris et al., US Food Company Branded Advergames on the Internet: Children's Exposure and Effects on Snack Consumption, 6 J. Children Media 51, 52 (2012); Frans Folkvord et al., The Effect of Playing Advergames that Promote Energy-Dense Snacks or Fruit on Actual Food Intake Among Children, 97 Am. J. Clinical Nutrition 239 (2013). 12 CARu, Case Reports, http://case-report.bbb.org/search/search.aspx?doctype=1&casetype=2. (last visited Oct. 21, 2013). 13 Tywanda H. Lord & Laura C. Miller, Playing the Game by the Rules: A Practical Guide to Sweepstakes and Contest Promotions, 29 Franchise L. J. 3, __ (Summer 2009). 14 Dale Kunkel et al., Report of the APA Task Force on Advertising and Children. Section: Psychological Issues in the Increasing Commercialization of Childhood, 5, 10 (Feb 20, 2004), http://www.sfu.ca/cmns/faculty/kline_s/320/06-spring/resources/sup_readings/childrenads.pdf (last visited Nov. 18, 2013).